Another week has passed and as promised on Monday I shared with you one of last weeks Sneak Peeks paintings which was "Celebration" the inspiration for Celebration came from seeing some silk screen paintings and the hundreds of tulip photographs I have taken over time. 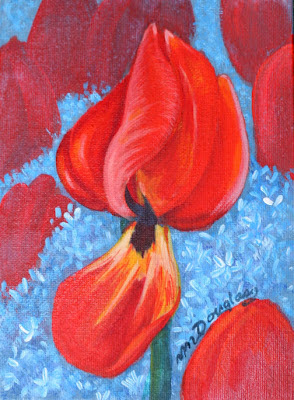 Now that painting has led to the idea of doing a series of small 5" x 7" tulip paintings. Of course any good artist knows that to do a series you should have a plan so first off is how many am I going to paint? In the throes of excitement the first number to jump in my head is 100 at the same time the sane part of my brain leaps in and said "WHOAAA are you crazy" Yes yes I know I have a problem with commitment, maybe 100 is to big, maybe 30 would be a better number, yes 30 sounds good, now ms .sane jumps in again with "oh dear I don't know about 30 that's still a big commitment perhaps 10." "10???? but that sounds so chintzy I want to do something BIG." 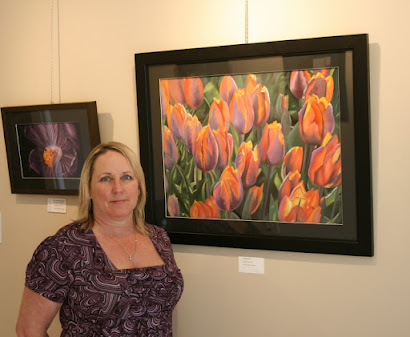 One of the meanings I found on the internet for tulips was that it represents prayer, as my painted tulip stands in a bed of Forget-Me-Not I am reminded not to forget my creator, to give praise to Him for the gifts that he has bestowed upon me, and to lift up others in prayer. To God I dedicate this painting. As a creative do you have on going arguments with yourself or your paintings? "Sheltered - A Coastal Arbutus"